(Español abajo) Officer Roger Garcia, who killed Meagan Hockaday this past Saturday while her 3 children were present, has a history of ‘shooting first, asking questions later’ in the presence of bystanders. 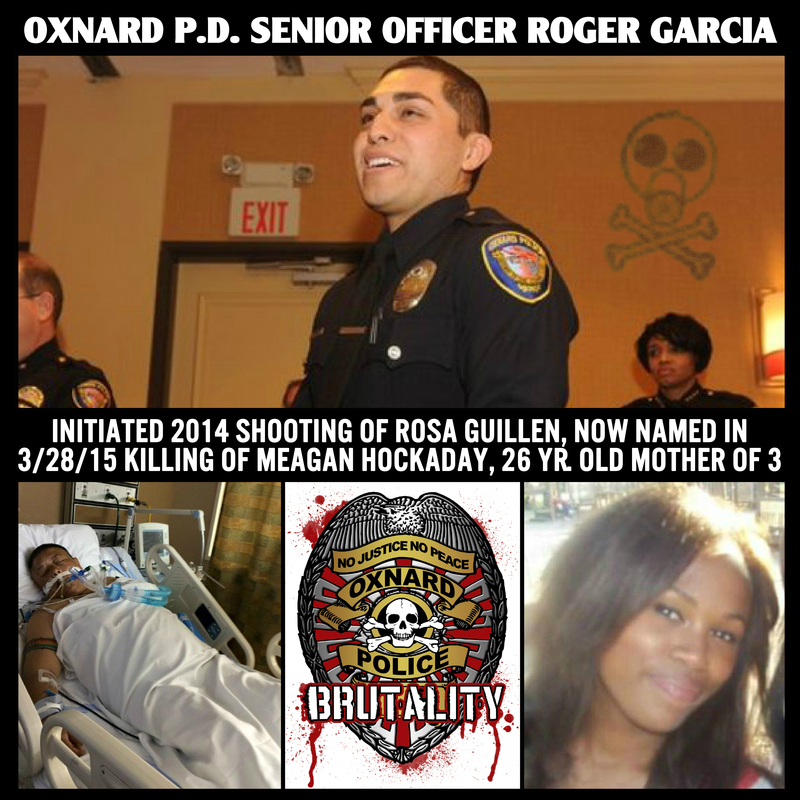 Comment from a friend of Rosa Guillen: “What Oxnard Police Department is failing to say about the shooting involving Rosa is that Officer Roger Garcia fired 36 rounds at her. 36! Missed every single one! The bullet that hit her came from an AR15 rifle that another officer [Officer David Landsverk] had. He felt threatened at some point. Think about this everyone, one magazine is emptied,15 bullets in each magazine, he unloads that, reloads another magazine, unloads that on her and reloads one last time. EVERY SINGLE ROUND MISSES HER! She was threatening suicide! She wasn’t threatening to kill anyone but herself, which is why Garcia, being the specialist with mentally ill was sent. Instead, it took a really bad turn. Something is wrong with this guy [Garcia]. This was at [Del Sol] park and they said she was the threat..think again. Wild rounds everywhere! I am NOT saying police cannot protect and defend themselves, but at what point do you reassess and realize the other officers with you are NOT firing their weapons! I BEG you, ask OXNARD PD TO BE HONEST. I have no doubt that there are great officers currently there and great officers that came from Oxnard PD, but there are also BAD. She did survive the shooting but that too was bad. She was in full cardiac arrest upon arrival to the hospital, had to have her heart literally massaged to be revived, is now missing part of her lung, metal plate on her rib, and forever scarred, physically, mentally, emotionally. “Está fallando Departamento de policía de Oxnard decir acerca de las disparo que implican Rosa es que oficial Roger García disparó 36 disparos a ella.y los 36b los fallo! La bala que hirió a Rosa vino de un fusil AR15, que otro oficial [Oficial David Landsverk].al sentirsee amenazado en algún momento disparo. Piensen en esto todo mundo, una carga completa fue vaciada, 15 balas en cada compartimiento, descargas, recarga otra ronda, descarga sobre ella y vuelve a cargar una última vez. CADA UNA DE BALAS NO ATINARON A DAR EN EL CUERPO DE ROSA! Ella habia amenazando con suicidarse! Ella no estaba tratando de matar a nadie más que ella misma, por eso García, siendo el especialista en tratar a personas mentalmente desestabilizadas fue enviado. Por el contrario, tomó un giro muy mal la actuación de Roger! Algo está mal con este tipo [García]. Esto fue en el Parque [Del Sol] y dijeron que era la amenaza…Piénsalo de nuevo. Salvajes balas por todas partes! No estoy diciendo policía no puede proteger y defenderse, pero en qué momento reevaluar y realizar que otros oficiales con ustedes no están disparando sus armas. Por favor, pido OXNARD de PD que sean honestos.